What could life look like on other worlds? An artist's depiction of what a habitable exoplanet might look like. NASA is launching a new research partnership to tackle the search for life beyond Earth, including life that may look very different from the kinds we're familiar with. 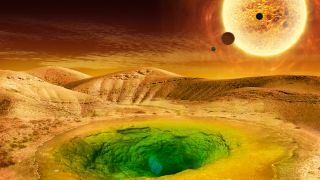 The new research partnership, called the Network for Life Detection, will bring together a new NASA center dedicated to astrobiology with academic scientists in order to sort out how life began here on Earth and where it might be lurking elsewhere in the universe. "The search for life beyond Earth cannot be a one-size-fits-all approach," Tori Hoehler, a biogeochemist at NASA's Ames Research Center, who will lead the new astrobiology center there, said in a statement. "To give ourselves the best shot at success, we need to develop tools and strategies that are tailored to detecting life in the unique conditions of other worlds, which are very different not only from Earth but also from each other." Another research center within the network will focus on how to identify so-called biosignatures, the fingerprints of life — even life very different from our own — that could be visible from a distance. A third center will focus on current and former ocean worlds, like ancient Mars and the icy moons of our outer solar system. Although the network consists of just three teams right now, NASA anticipates bringing in dozens more groups over the next few years to capitalize on the astrobiology research being done across the country. "We now have the scientific and engineering expertise to address this profound question with the clarity of scientific evidence — and we have a great community of scientists ready for that grand challenge," Hoehler said.